Our Mini GrindR sanding discs bring a new level of performance to quick change Type R discs. Aluminum oxide abrasive grain is fused directly on to a one piece polymer backing with Type R button to fit all standard holders. The one piece polymer backing is stronger than a standard button attached to a cloth or paper disc. 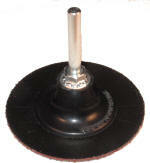 Also the polymer backing allows for cooler grinding and much longer disc life. These discs can be used with a holder that is one size smaller than the disc. For example you can mount a 3" disc on a 2" holder giving you added flexibility on the outer edge. The table below shows the most popular aluminum oxide discs for grinding and sanding most ferrous metals. In addition they can be special ordered in alumina zirconia and silicon carbide. If you like our Trim-Kut discs you will also like these quick change discs. 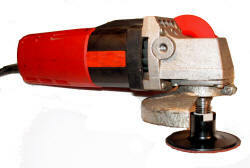 By using our Heavy Duty Convertible Holders you can use these quick change discs with a right angle grinder. Sold by the pack of 20 discs.